Some artists favor a demure profile. Olivier Mosset is one of those: elusive yet bona fide. Tutto d’un pezzo, as we say in Italian. He spends much of his time traveling. “I am semi-retired,” he says, though regularly partakes in projects, exhibitions, and collaborations around the globe. For the occasion of Exposition de groupe—an exhibition which took place at The Kitchen in early December—Mosset traveled to New York from his adopted home of Tucson, Arizona and spent a month catching up with the city’s art scene. I heard of his visit through curator Peter Scott (who wrote an essay on his work for GREY IX) and intended to plan a time to meet, but I later acquiesced to the artist’s notorious elusiveness. During his stay, we serendipitously met at press presentations, gallery openings, and exhibitions around town. One of those encounters happened one damp fall morning in the Upper East Side during a press preview for French artist César. The semantics surrounding motorcycles are charged and evocative. A motorbike is rarely a mute tone in an artwork, and not an acquiescent visual material to deal with. 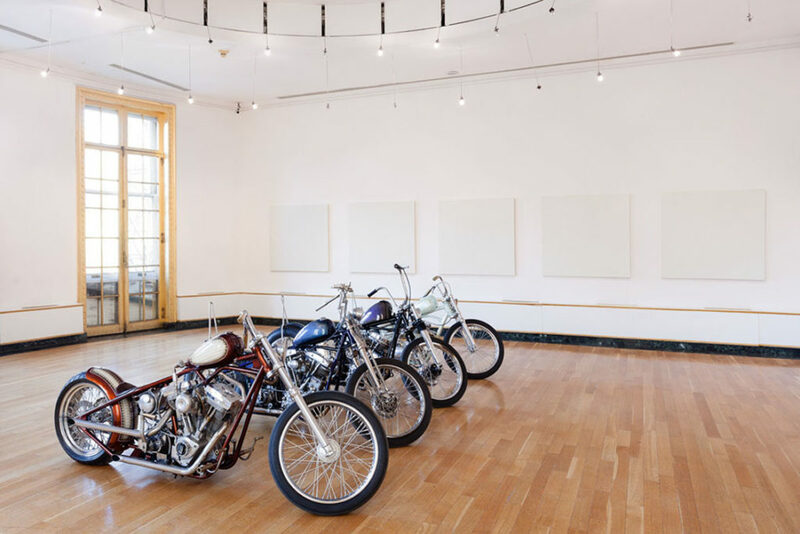 Mosset’s motorcycles have no desire of becoming an artwork, a sculpture—they can and will be ridden out of the gallery space. The earnest adherence to their original purpose is what makes them art on their own terms. There is a sense of playful austerity in this disposition, Mosset concedes, while bending down to clean motor oil leaking from his Panhead on the immaculate parquet floor. Jeffrey Schad and Vincent Szarek, High Lil’ Pony, 2011. 1969 Triumph Tiger, 39 cubic inches, 650 cubic centimeters. It was 1969, or something like that. Twenty-five, twenty-six. I used to have motorcycles, yes, I was interested in that but I used to separate the art and motorcycles. I did not talk about it, actually. Did you consider that just part of your private life? Yeah, exactly. Then people like Steven Parrino, Sylvie Fleury, came about—and today you can show anything, and it’s all right. The first time I showed motorcycles and paintings they were motorcycles by Indian Larry, the customizer. At one point he fixed an engine for me, and I said, “Do you want to show the motorcycle in some Manhattan gallery?” and he said, “Yeah, yeah.” Then he died in a motorcycle stunt, and I forgot about it, but his shop went on for a little while and I talked to the lady there, saying that we talked with Indian at one point about this—it was a casual conversation. But she said, “You know what, we still have the motorcycles, so if you still want to do it we can do it.” And that’s the first time I did. Was it your idea then to show them in a gallery? It’s because the motorcycles were amazing. Indian Larry, he’s kind of a legend. Also, at the same time—I have to try to remember, it was maybe even before then—I had a conversation with Steven Parrino, who was also interested in this “‘bikers culture,” or whatever you call it. 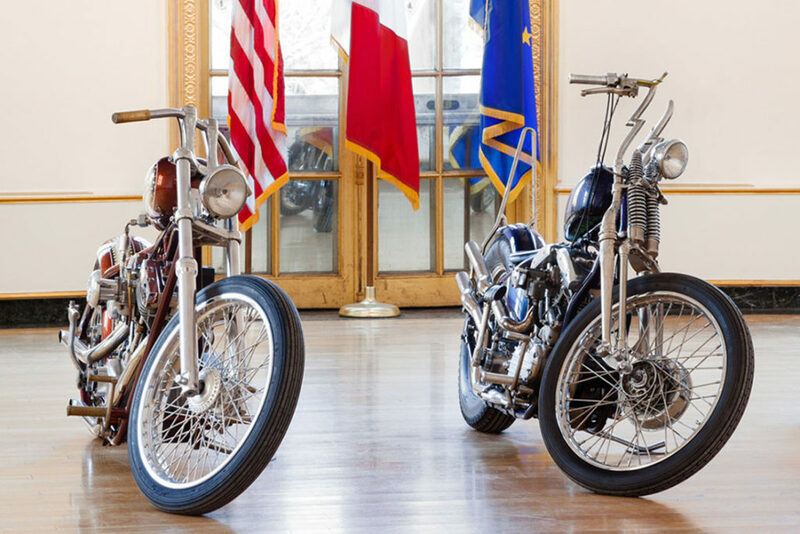 There was a show in Switzerland—a promenade, outdoor sculpture thing—where they often invited the same people, and I thought, if I was to be invited again I’d build a motorcycle and show it there—which I did. 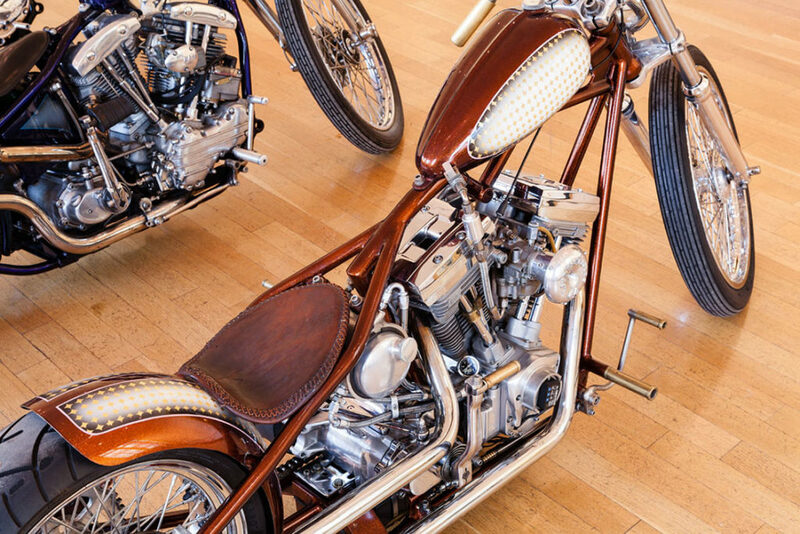 Left: Olivier Mosset, Jeffrey Schad, and Vincent Szarek, Panhead, 2011, 1965 Harley Davidson FLH, 74 cubic inches, 1200 cubic centimeters. This one was a nice motorcycle, but it did not have any paperwork or anything, it was just running. I thought that as a gesture, in the art world, it was cool but really just ok… it was not a great motorcycle. Vince Szarek, who painted all these here, at one point said, “You know what? I painted a motorcycle for a friend of mine, you should see it”—or something like that—so we went to see Jeffrey. It was his motorcycle that Vince had painted. At that point I said I had a ’65 Panhead, and maybe we should customize that. That’s what we did. My idea was to do it nicely, to do a motorcycle that we could show in a motorcycle show—which is exactly what we did. This would be your main bike. Yes. In fact I drove it before it was customized from New York to Arizona, to Tucson, passing by Sturges, and it broke—you know, they’re old and they all have problems. There’s this culture of customizing, and keeping the quality. I am friends with all these people, we have a little bit of the same style, kind of a fifties type of radical motorcycle. That’s how it started. We showed the Panhead in a couple of group shows, and then I had a show in a gallery in LA, where we showed Jeffrey’s Rootbeer, Vince’s Triumph, and mine with these monochrome paintings. When Sophie Claudel asked me to do something here, I was happy to add one bike by John Copeland, so it’s not exactly the same show we had in a LA. These bikes exist in different worlds. They are exposed in different venues—a motorcycle show vs. an art gallery—and people, in turn, perceive them differently too. True. They’re just appreciated in different ways. In here, they stand as an artistic statement, whereas in a motorcycle show people would probably get more excited about the mechanics. Jeffrey Schad’s lace paint job on your Panhead is very well done. The lace thing is something they used to do in the fifties. In fact we also did a car, a ’65 Bel Air, Vince and Geoffrey worked on it and painted that with lace. We showed it in Tucson, and here in New York in a bar for a while, and we drove around with it. The plan is to ship it to France now because I’m having a show in Paris, and I’ll bring the car. The decision to include bikes and cars in your art shows was organic then, it wasn’t something you just decided overnight. 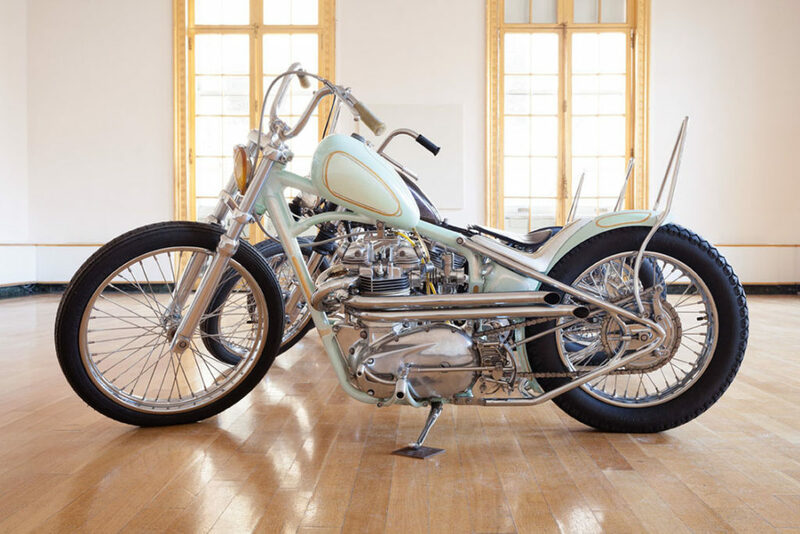 No, it was because of Indian Larry, and the bikes… not just that, I always knew there was an aesthetic quality in motorcycles. You bring these bikes on the streets and people will stop and look at them. When did you make the connection between the two practices? It was the conversation with Indian Larry at the beginning. It was also because of people like Sylvie Fleury who showed the cars, and in a way César’s art too. 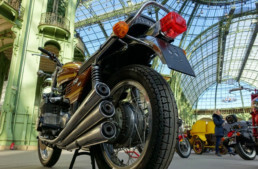 It is because of the aesthetic quality that these motorcycles have that these things are possible, that they can be shown in a gallery. How was it working with Indian Larry? He was good. He was a good mechanic. He didn’t do any design for me, he only worked on the engine. Peter Scott, who wrote an essay on your work for GREY IX, mentions how there’s sometimes confusion in the art world p the ‘artwork versus industrial design’ debate. 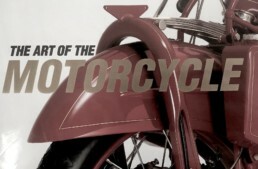 He cites the example of The Art of the Motorcycle exhibition at the Guggenheim. Care to comment? Jeffrey Schad, Rootbeer Bike (2011). 2004 Harley-Davidson custom, 96 cubic inches, 1582 cubic centimeters. Look, this is an actual leaf. It looks like a marijuana leaf. Where do you keep the bikes when they aren’t traveling around the world? In Brooklyn, these people work out in Bushwick. How do you like working from your Tucson studio versus your New York one? Well, in Tucson… I have motorcycles there, I have nice cars… and in Arizona you don’t need a helmet! In a few states outside of New York you don’t. It’s good though, you should not have any accident because it’s trouble. I woke up in a hospital one day in Paris… though I had a helmet. I grew up riding with a helmet in Italy, but the feeling is very different when you ride without one. It depends on the roads too, it’s a different style of riding from what I’m used to. Going on road trips with motobikes in Italy… there’s some serious curves there. Are you into the biker club’s scene at all? I was. When I was younger in Paris that was the scene. These people became Hell’s Angels, though I knew them before. I still have friends there—in fact that’s why I keep a motorcycle in Paris—but I’m getting a bit old. I don’t ride at night anymore.